The Pacific Coast Highway is an iconic roadway located on the central Californian coast of the United States spanning 198 kilometers. Its windy, cliff-hugging curves and breathtaking views are a dream for riders. 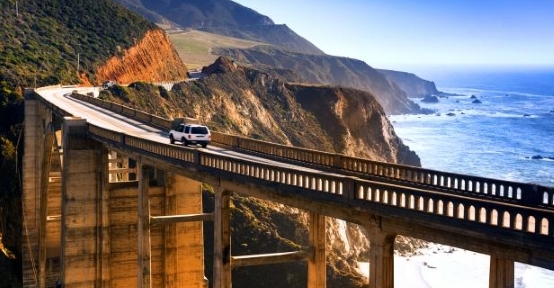 The scenic highway takes in Big Sur Coast Highway as well as San Luis Obispo North Coast Byway. When you hop on your motorbike along the Pacific Coast Highway, which has been designated as the All-American Road, you’ll be well on your way to experiencing the American dream on the open road. Beginning in the historic town of Monterey, the Pacific Coast highway takes travelers through scenic, art-filled Carmel-by-the-Sea and Big Sur for breathtaking views of the mountains as they plunge down to the Pacific Ocean. As you make your way south, the scenery changes to hills dotted with oaks as you make your way past Hearst Castle and Morro Bay. 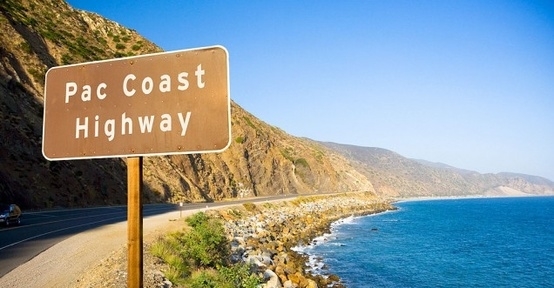 Known for its narrow winding shoulders and steep drop-offs, the Pacific Coast Highway as exhilarating as it is beautiful. Your dream ride begins on Route 1, which is located in historic Monterey, California. This town served as the capital of California throughout history. Before you hit the open road, you may want to visit Royal Presidio Chapel, Larkin House, Custom House as well as the other historic adobe buildings in Monterey. The town is also home to Fisherman’s Wharf, Cannery Row, and the Monterey Bay Aquarium. To escape the tourists, you might duck into Monterey State Historic Park for a picnic before you take off. Almost 5 km down the Pacific Coast Highway along Highway 1, you’ll experience postcard views of Carmel-by-the-Sea. This village features colorful beach cottages, inns, shops, art galleries, and restaurants accented by Monterey pines. You likely won’t be able to resist exploring this quaint village as well as the expansive Carmel River State Beach. Another 5.6 km down the highway, you’ll arrive at Point Lobos State Reserve. The reserve features tide pools, coves, meadows, and headlands. Trails on the reserve provide an opportunity to see rare Monterey cypress trees as well as over 200 species of mammals and birds such as grey foxes, sea otters, and deer. Between December and April, you might catch a glimpse of grey whales as they migrate. As you make your way through the Carmel Highlands, you’ll arrive in Big Sur, and area spanning 145 kilometers and featuring breathtaking granite cliffs in the Santa Lucia Range over the sea. The power of nature will overcome you along this section of the Pacific Coast Highway. Other destinations along the highway include Garrapata State Park and Old Coast Road. You’ll also want to take in Bixby Bridge, Pfeiffer Big Sur State Park, Nepenthe, Lucia, Plaskett, and Gorda. The final destinations along the highway include Ragged Point, and San Simeon. When you reach Cambria, you’ll know you’re nearing Morro Bay and the end of your dream ride along the Pacific Coast Highway. In Morrow Bay, be sure to take in Morro Rock. This turban shaped rock formed from extinct volcanic cone approximately 23 million years ago. It stands 176 meters high and can be seen throughout the bay. The Pacific Coast Highway is a place to get lost in the experience. One minute you’ll be filled with an adrenaline rush as you hug the curves along the edges of sharp cliffs and the next you’ll be taking in the awe-inspiring natural beauty of the trees, ocean, and rocks under the warm California sun. This is what makes it one of the world’s true dream rides. If you want to ride the Pacific Coast Highway and are thinking about buying a new bike, or want to sell your motorbike in order to fund your trip, call us today - we buy any bike!